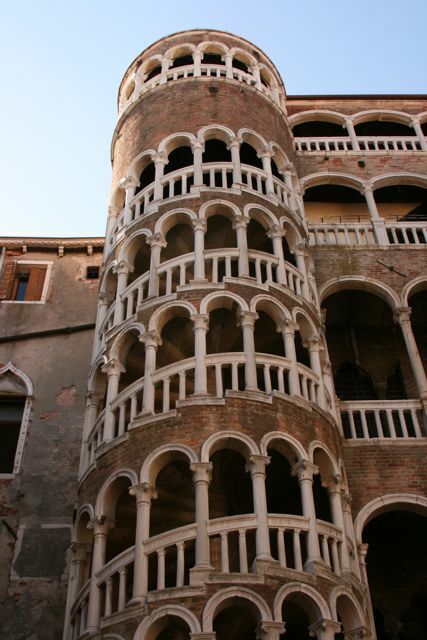 Medieval and Renaissance Venetians often built exterior staircases on their homes to save precious living space. But the architects of the Scala Contarini del Bovolo -- or staircase of the snail shell -- took the art of floor-to-floor mobility to a new artistic level. 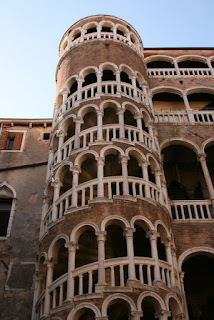 Peter Contarini added the staircase and series of loggias to his palazzo near the end of the 1400’s. The staircase and loggias, possibly designed by Giovanni Candi, have characteristics of both the earlier Gothic style as well as the Renaissance fever for Romanesque design. But as we stood there my architect husband and I were most impressed by the engineering required to make the staircase look symmetrical when the floors it links are not. Who will love it? : photographers, architects and anyone interested in cool-looking buildings. Notes: The Scala del Bovolo is currently being restored (as of November, 2009). An opening date has not been announced. When the restoration is completed, visitors will once again be able to climb to the top (for a fee) and take in the view of Venice’s rooftops. But for now visitors can see the Scala from the exterior all day and evening and can take photos through a tall fence. Be mindful, however, that the corte where the Scala sits is filled with apartments and a small hotel, so visits in the middle of the night are discouraged. San Angelo and Vallaresso are the closest vaporetto stops to the Scala del Bovolo. The calles in the area are small, and it can feel as if you are headed in the wrong direction. Take a map, and don’t be afraid to ask for directions. There are a few signs on the calles directly surrounding Corte dei Risi. Don’t miss La Fenice, Venice’s famed opera house which is just “around the corner” in Venetian style. I also recommend a visit to the Museo Fortuny which is close by as well.